You know your life is at a crossroads when you start making homemade yogurt. My lifetime experience with yogurt follows. People always said, “Go to the supermarket. Get some yogurt. It’s good for you.” We always do what’s good for us, so about once a month I buy some yogurt at the supermarket. It’s good for me. People say so. Each month I go through the refrigerator, look for the yogurt with the “best by” dates in the last millennium, and gently toss them in the trash. No one ever said to eat the yogurt. For some very detailed instructions and some excellent tips, most of which are ignored here (probably to our detriment) try this site. Why “sterilize” the pot and spoon? This is done to make sure “rogue” organisms don’t accidentally get into the milk and, instead of making it into yogurt, ferment it into beer. Just kidding Drinking Hat Guys, you can’t make beer out of milk. Only White Russians. But the rogue organisms have some truth behind them. The first school of rogue thought sterilizes the cooking utensils, then takes care of the rogue things by heating the milk up to 185 degrees F. for 30 minutes. However the other school of rogue thought says, if the milk is already pasteurized, you can skip the milk heating step. That’s why you’ll need the heating pad. But first, it, the heating pad, has to “incubate” the yogurt brew for about 7 hours. While you’re waiting sit down and have a couple of Scotches to sooth that sickly nerve. It’ll work faster. Where will you find active yogurt cultures? First, don’t look in your sink drain. There may be active cultures there, but they’re the wrong kind. To find the right kind, take a magnifying glass to the supermarket dairy shelves. In the yogurt section, find the plainest yogurt you can. That will be probably be vanilla. Skip the ones with fruit in them. Take the magnifying glass and look for words similar to “Contains live and active cultures” on the container. Buy that single container. That’s what you’ll need to make your own. 1 – heating pad or some other heat source which can keep a pot of milk at around 110 degrees F.
In a 3 quart pot, bring a few cups of water to a boil. Place the metal spoon in the water. Cover and boil for about 15 minutes. Drain the water from the pot, saving the spoon from falling into the sink. Add the milk to the now empty cooled somewhat sterilized pot. 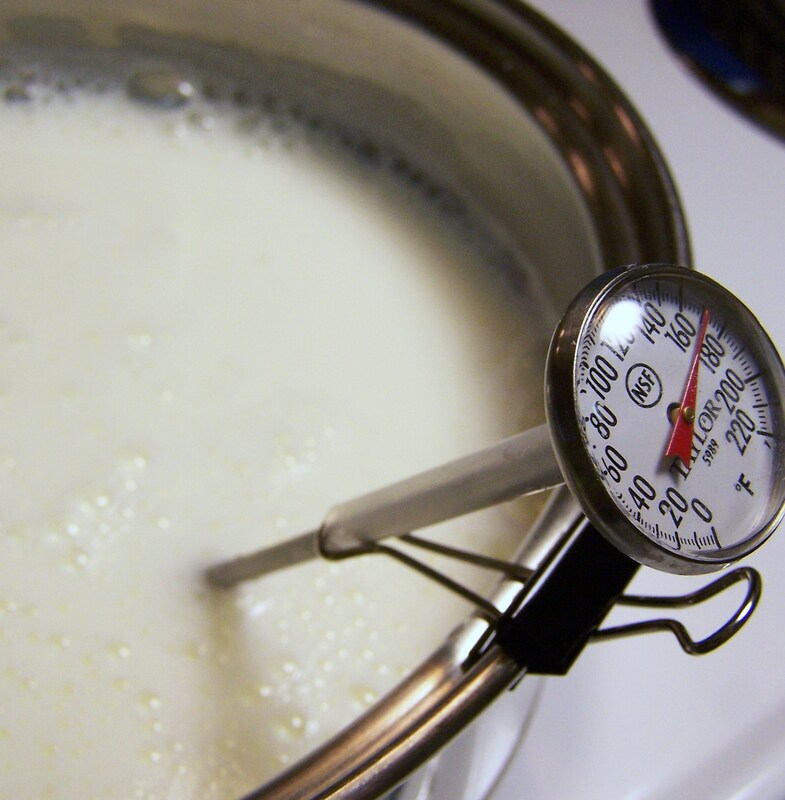 With your improvised thermometer dangling attachment on the pot, heat and stir the milk until the milk reaches 185 degrees F. Lower the heat and maintain this temperature for 30 minutes. Don’t worry about scalding some milk on the bottom of the pot. You will. This will take longer and require more heat than you could ever imagine. You’ll eventually get there. A second method is to use a double boiler to achieve the same temperature and duration. The real question is whether this whole step can be skipped if using pasteurized milk? I suspect so. But this time, I went through the heating process. After the 30 minutes of heating above, fill your sink with a few inches of cold water. Carefully, place the pot in the cold water to cool down the milk to around 110 degrees F. Be careful not to capsize the pot in the sink. It should only take a few minutes for the milk to cool. When cool, remove the pot from the water. Check the temperature again. 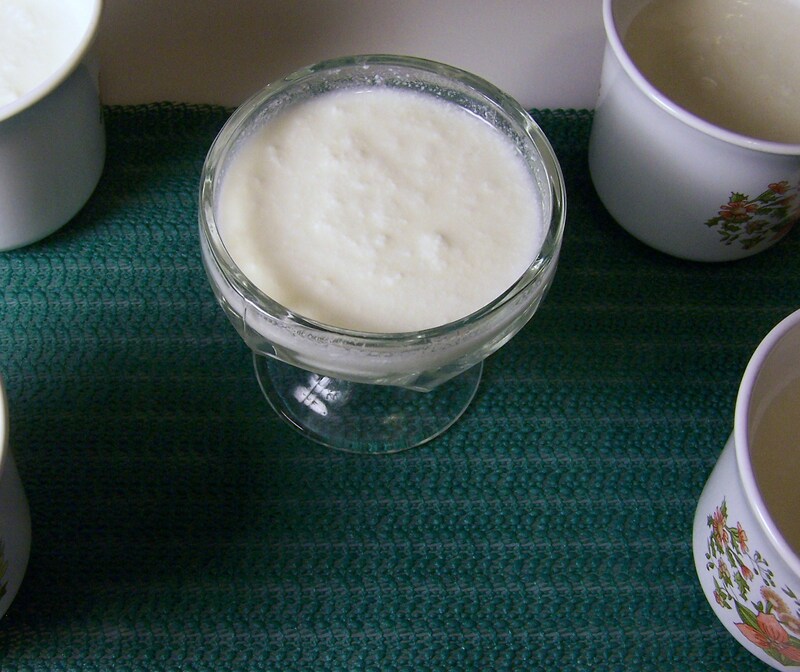 The next step is to add the live yogurt making culture to the prepared milk. The temperature of the milk cannot be above 110 F., otherwise the culture will be killed and the yogurt will flop. To the 110 degree F. milk, stir in 2 to 3 tablespoons of the “active culture” yogurt you purchased at the supermarket. Set the heating pad to medium or high, cover the pot and place it on the heating pad. Place a small towel over the pot to insulate it and help keep the heat in. Check the temperature in the pot after about 30 minutes. Adjust the temperature of the heating pad, if needed, to keep the milk yogurt mixture between 100 and 110 degrees F. After you do this once, you’ll soon do some web surfing and find there are relatively inexpensive “yogurt makers” that do all this heat regulation for you. But for the first time at least, do it the hard way. Let the milk do it’s thing for about 7 hours. Check the temperature from time to time and adjust the heating pad if needed. After 7 hours, stir the yogurt to a smooth consistency. The yogurt should have thickened nicely and the milk mixture should now look like yogurt. That’s because it is yogurt. Divide up into smaller size containers, cover and refrigerate. Add fruit, sweeteners, flavorings or whatever, if that’s the way you like it. Or, eat it as is. Naturally, you can use this in any recipe that calls for yogurt. The really rewarding thing about this is, it works! It’ll be your only high school science experiment that actually worked. Now if I can find someway to date the small containers, I’ll be ready when the next millennium arrives. This entry was posted on 01/29/2012 at 09:00 and is filed under Recipes, Recipes, food, cooking and related items. You can follow any responses to this entry through the RSS 2.0 feed. You can leave a response, or trackback from your own site.